Akriti has led a pretty much sheltered life. Zayn has been shuttled from city to city when he was growing up. She is comfortable watching her life from the sidelines. He wants to feel rooted to a place he can call ‘home’. They meet each other quite by chance. And both seize the chance to be someone they both need in their lives: For Zayn, it’s a 'Partner-In-Crime'. When their worlds collide, It is not what either of them expected it to be. Zayn has a steady girlfriend. And Akriti has a crush on him. What happens when these two become friends? The biggest adventure of their lives? Or the road to heartbreak? What happens when two completely different people collide? Do they become friends? Or, is their friendship doomed from the start? 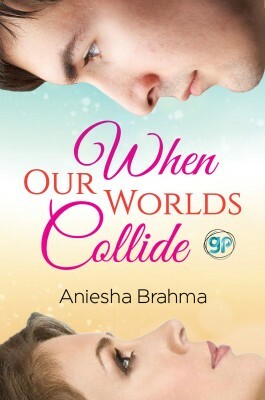 'When Our Worlds Collide' is the story of two twenty-three-year olds, Who are finally growing up and finding their feet in the world. A tale of friendship and love, crushes and betrayals, messes and second chances, Marriage and divorce… and the elusive happily ever after! This is the story of Akriti who is leading an isolated life without friends, managing her mom's cafe. Zayn is the boy friend of her school friend Nimmi. Akriti has a crush on Zayn and both share their common interest in poetry. Akriti lives with her mother who is a divorcee and hates her father who marries another woman. Akriti takes care of her mother's cafe, puts her all efforts to make it the most happening place in Kolkata. It is her story of crush, friendship, aspirations and the lessons that she learns from her life experiences. It's a casual love story with the focus on each individual character and their identities. There is a quotation in each chapter and I loved reading all of them. The narration is fine. Writing style is easy to follow. I loved the way each character is portrayed, especially Akriti - how she transforms into a matured individual by the end of the story. There are one or two grammar mistakes. Editing might have been better. The narration became boring when I completed around 75% of the book and I wanted to flip pages faster after that. The climax is good, but I am not very convinced on Akriti's decision about Zayn. I couldn't understand the relationship between Akriti and Ayub as well. Overall, it's a casual read. Aniesha Brahma knew she wanted to be a writer since she was six years old. She was schooled in Dolna Day School and went on to pursue B.A., M.A., and M.Phil in Comparative Literature from Jadavpur Univeristy. She currently lives in Kolkata, with her family and five pet cats. The Secret Proposal was her debut novel, followed by The Guitar Girl. She was a contributing author with her story The Difference, in the anthology: Voices, Old & New. When Our Worlds Collide is her third work of fiction, and first novella. PS: Received this free review copy from the author and this is my honest opinion on the book. May be I am not into casual love stories now Pratikshya. Thanks for sharing the review...gives a clear insight into the book!Not sure though if I would like to have a go at it, having gone through the review!! Esha, Go for it if you like casual romance without many twists in the story. Why Book Reviews are important? Awesome Inc. theme. Theme images by cmisje. Powered by Blogger.